Mossy recently had a run in with a deer on his ride home. 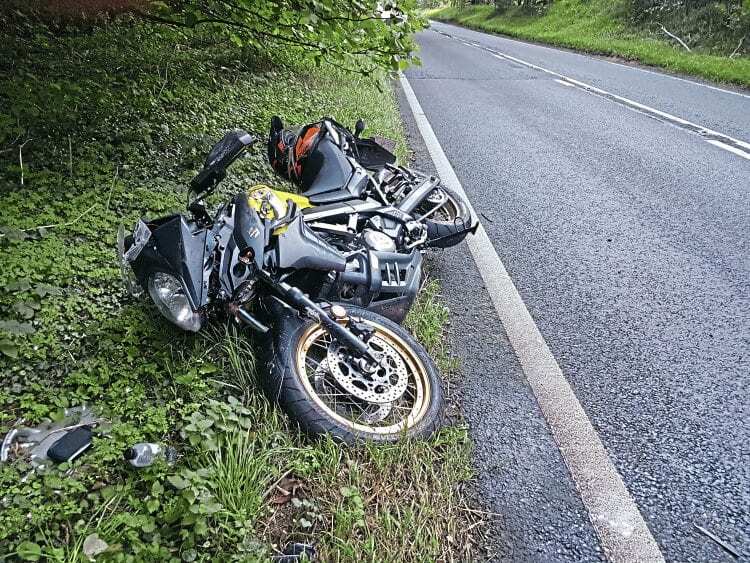 He survived the crash with only minor injuries, thanks to some quality kit. I’m of the opinion you never stop learning from riding motorcycles. When you part company with them, the lessons can suddenly become all the more serious. My first crash on the road for over 10 years, courtesy of a young deer running into my path, certainly taught me some things. The most important one being the crucial importance of what you should, and shouldn’t wear. Given my accident came regardless of my near 40 years of experience and all the skills I’ve learnt along the way, it proves you can’t ever predict everything. Judging by the evidence of multiple points of impact on this two-piece suit, it’s obvious my fall included at least one body roll. First, and heaviest impact appears to have been made on the left hand side with the forearm taking the brunt of the crash. 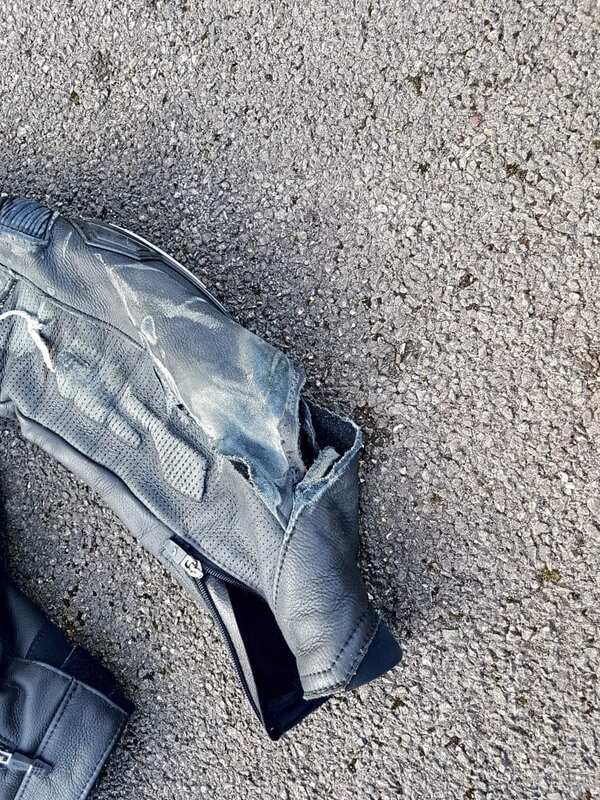 Sustained contact with the road surface has worn through the seam of the reinforced area of elbow protection and that initial impact has taken some skin off my arm. 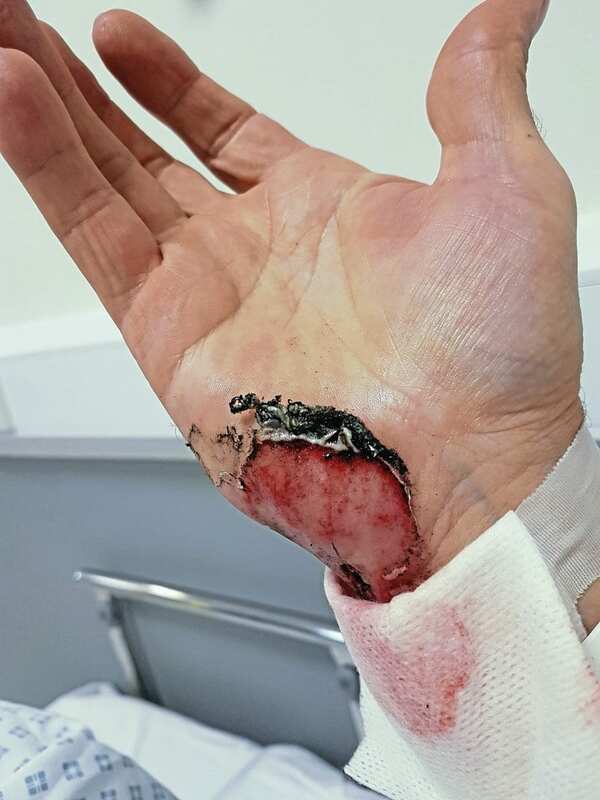 This did not come from any abrasion with the Tarmac itself, merely through the shock of the first contact dislodging the tissue. 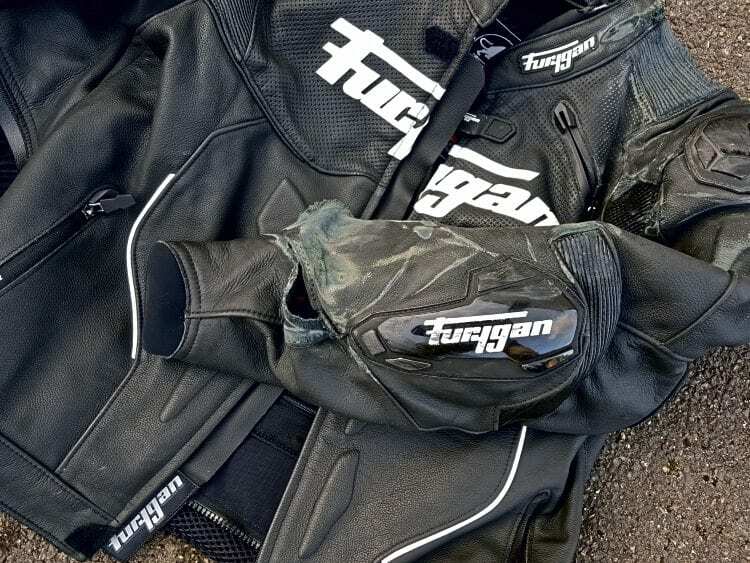 Scuffs on the shoulder, bottom and left thigh areas all further indicate the seriousness of the crash, yet bar some small marks on my shoulder and knee flesh, I remained intact and unharmed. 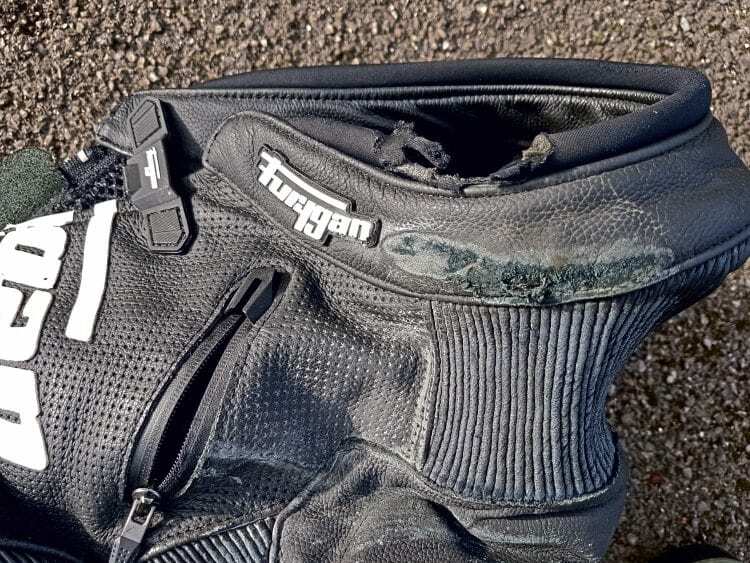 The flexible D30 body armour has clearly done a good job of absorbing all the impacts and allowed me to walk away virtually pain free. 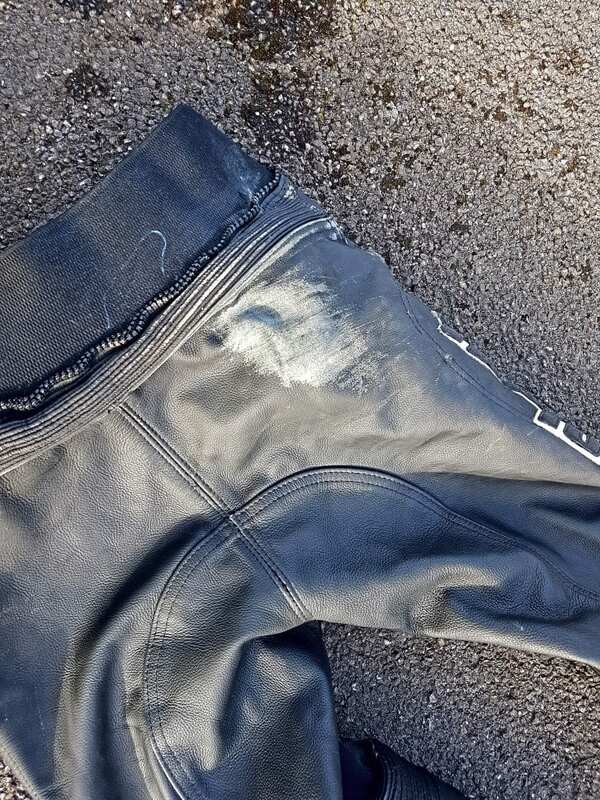 In the opinion of an expert from a well-respected rival leather manufacturer, the Raptor suit has performed just as it should and protected me well. 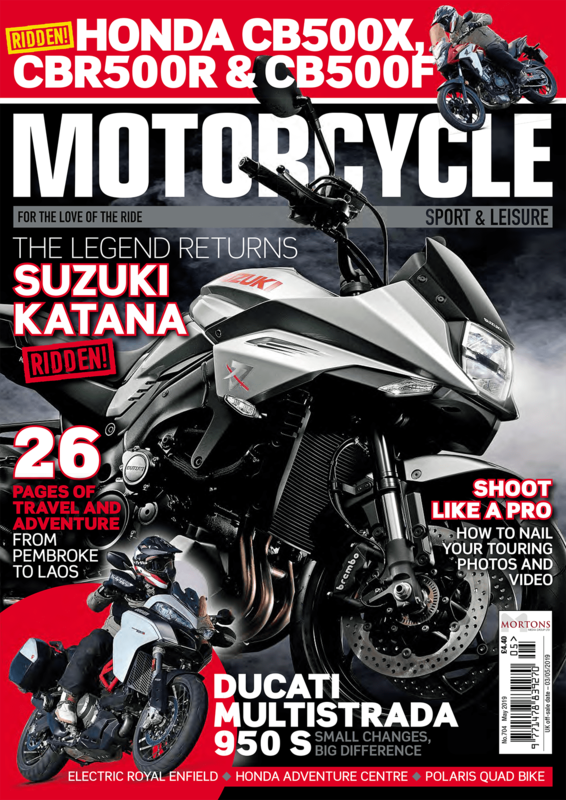 I’m certainly convinced and will feel happier testing bikes in another Raptor two-piece suit as soon as possible. Not only do I feel comfortable in the stylish, well made. CE-approved kit, I now know I’m safer in it too. 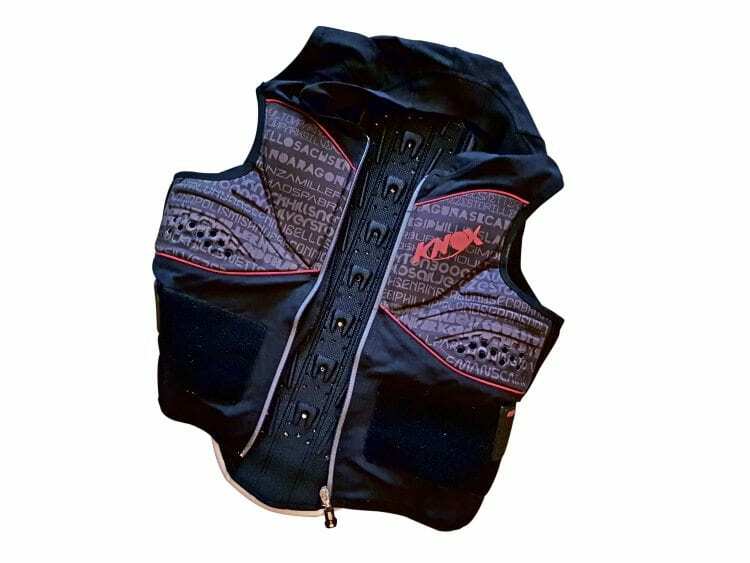 Probably the most important bit of kit I was wearing from the point of view of critical injury prevention was the Knox Track Vest. From some of the aches and pains I felt around my back area immediately after the crash, it was obvious I’d taken a few heavy knocks in the fall. Thankfully I suffered nothing more than this and there were no lasting effects. Being without it doesn’t bear thinking about. 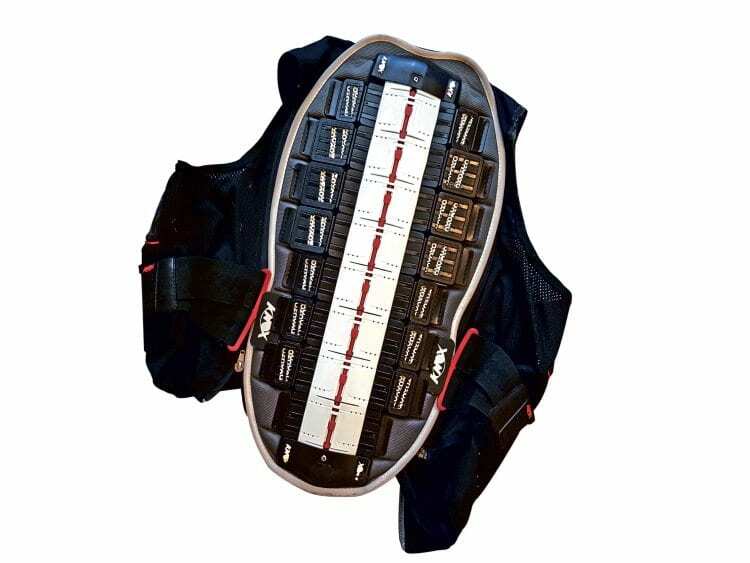 Guidance from Knox suggests the back protector should be replaced after a heavy fall or every five years. 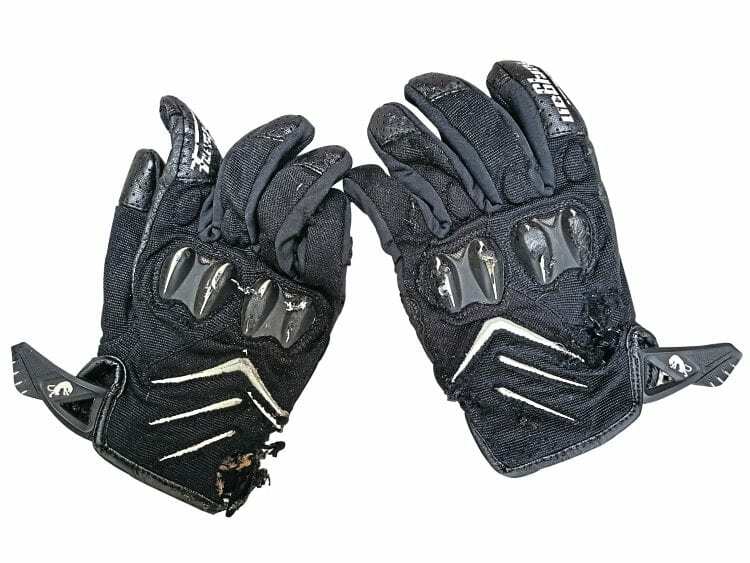 These gloves are some of my favourites thanks to their light, breathable construction, ease of getting on, and superb feel. However, the summer gloves are not designed to offer to the sort of protection I needed in this accident. Textiles simply can’t give the same level of abrasion resistance as leather and as a result I took quite a bit of skin off my right palm, and back of my left hand. The blood and pain provided a sharp reminder of why the most appropriate kit has to be worn if you want any chance of remaining intact. It’s leather gloves with a longer cuff for me from now on. I’ve never experienced anything like it. 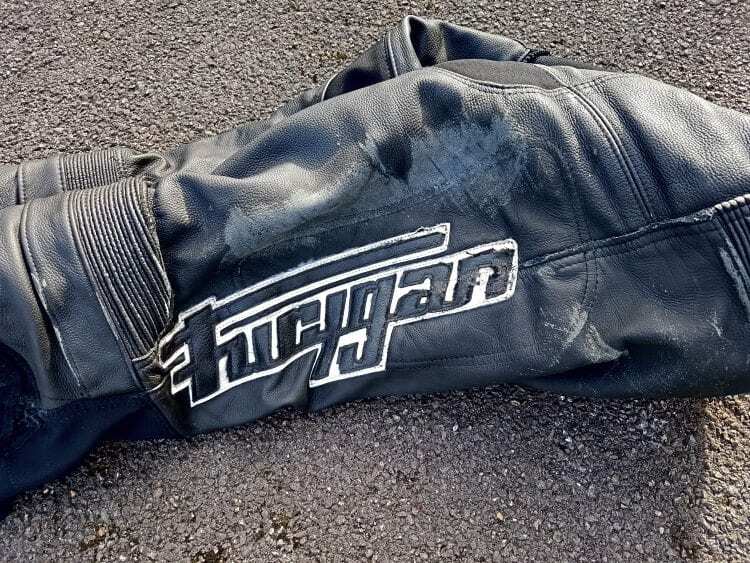 Riding home on a balmy evening along a quiet Fosse Way with just 10 miles to go, without any warning I’m suddenly slammed onto the deck. 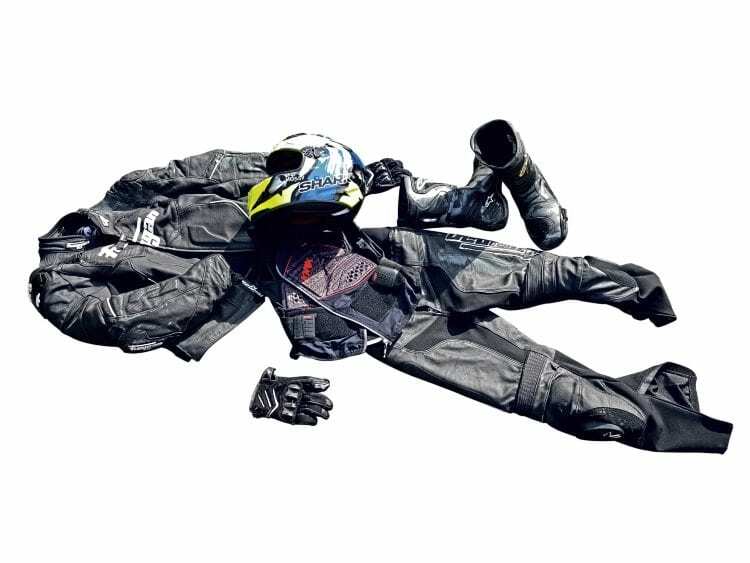 As I slide down the road I try to come to terms with why I’m not still in the seat of my V-Strom! When I come to a halt, the evidence lies in the distance. A now deceased young deer had leapt out of an adjacent forest directly into my path at point blank range. There was zero chance of avoiding it. Accident explained.